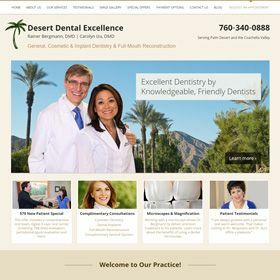 Get a website that is a true reflection of your practice and your dentistry. We are offering our top-quality websites for a great price through the end of the year! Any client who has one of our custom magazines can take advantage of this offer. An accurate representation of the quality of your dentistry. Custom and personalized information on your services. A look into your practice and an opportunity to get familiar with it. The website works synergistically with the magazine to increase magazine inquiries as well as to produce website inquiries. As your website is designed to be an effective marketing vehicle, people coming to it from your other marketing or from referrals will be more likely to make an appointment at your office. The bottom line, we can make you a website that will be a true reflection of your practice and dentistry. Please give me a call to find out more! 855-486-2410.